You are probably aware of the lantern led ghost walk tours given by the Old South Tour Company which include a tour of the Old Smithville Burying Ground, but did you know that you can take a daylight tour as well? These tours, led by Musette Steck, a local historian, take place each Wednesday afternoon starting at 2 PM. You might hear strains of harp music as she tells you about Tony, the ghost who used to play his harp in what is now The Brunswick Inn Bed & Breakfast. 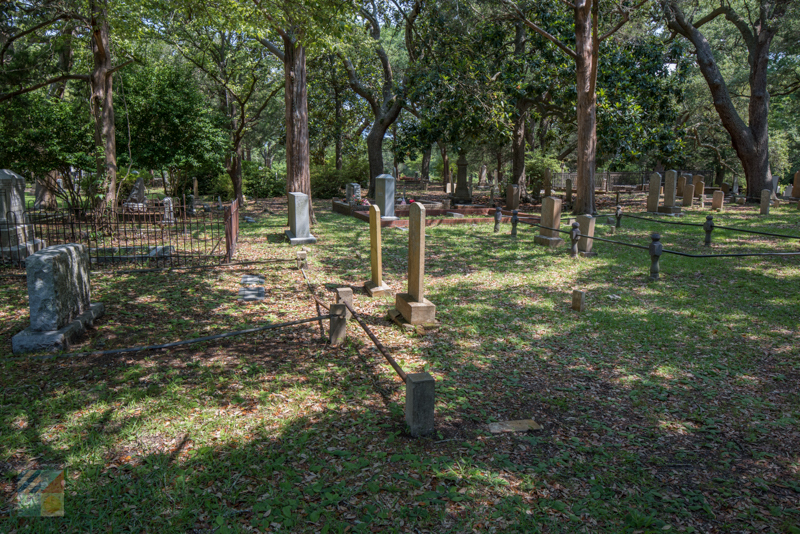 You will hear the story of the man whose legs are buried without his body and the reason for the tree stump markers that can be found in the cemetery. Tours are free, however, donations benefit the Fort Johnston/Southport Museum. Special tours can be arranged by calling: 910-454-0437. Both Southport, NC and Oak Island, NC are designated Tree Cities USA. Who doesn’t love the old live oak trees the line the streets in Southport? Beyond the beauty offered by trees, their benefits to us and to the environment are numerous including clean air by the reduction of smog and greenhouse gases. Do you know you can get 10 free trees for a $10 donation? In the month of August, the Arbor Day Foundation is holding its Trees for America Campaign. For this small membership fee, you will receive the trees, information about planting and care, and their bi-monthly publication . Check it out at: arborday.org/august. On Saturday from 10 AM – 2 PM you can explore the arts at the Leland Cultural Arts Center in Leland, NC. Here you can meet the instructors and enjoy demonstrations of their artistic processes as well as a ballet performance by students. You and your family members who are 11 years old or older can try out working in clay on a potter’s wheel. Poor Piggy’s BBQ & Catering food truck will be there to add to the fun of your day out. This entry was tagged Arbor Day Foundation, ballet, cemetery, food truck, free trees, Leland Cultural arts Center, Leland NC, Oak Island NC, Old Smithville Burying Ground, open house, pottery, Southport NC.